When you get right down to it, the biggest part of bottled water’s appeal is convenience. Its success has been about saving time and effort. When you’re thirsty and on the go, the quickest fix is to buy a bottle of water at the nearest corner store. But drinking bottled water is a choice, not a necessity. Many of us now realize that bottled water is no healthier than tap water and portability is also not a factor. 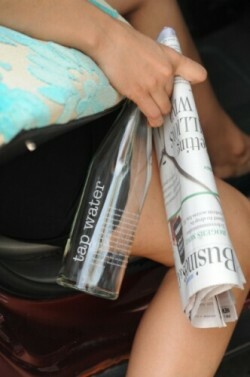 A better choice is to use tap waterTM bottle - A smart solution, and just as convenient.